Chris Doak will compete at the European Tour Qualifying School despite not knowing the extent of the injury that has hampered his season. The Scot had an MRI scan on Monday on a possible trapped nerve in his neck. And while he awaits the results of the scan, his determination to try to regain his European Tour card is such that he will fly out to Spain to compete this week. "I said before that the fighter in me says I want to go," said Doak, 37. He has recently been working on the issue with his coach, Kevin Craggs, and says he is feeling "more confident". The Glaswegian added: "The hand is getting a wee bit better, my grip is getting a little bit more back to normal, although I've still got a little bit of pins and needles. "When I sleep, the pins and needles come back, so that's a problem in the mornings. "I can only hope I get an afternoon tee time, although I don't know if I can ask to get four!" 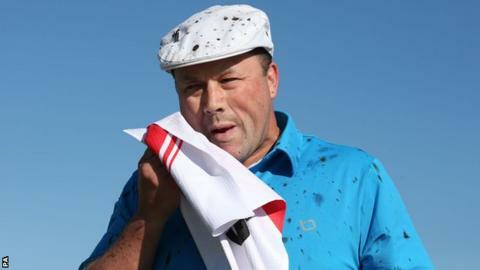 Doak was 153rd in the European rankings in 2015 and, having finished outside the top 110, failed to automatically retain his card for the main tour. He enters at the second stage of qualifying from 6-9 November, when he will play 72 holes over the Campo de Golf El Saler course in Valencia. Should be progress to the final stage, he will play at the PGA Catalunya Resort near Girona from 14-19 November.